Make this wonderfully festive Christmas Tree Slime Recipe for some sensory fun with the kids this holiday! We have been having SO much fun riding the slime craze at this house, with 4 kids who can’t stop playing with it and thinking up fabulous new ingredients to add in each time we mix a new batch! 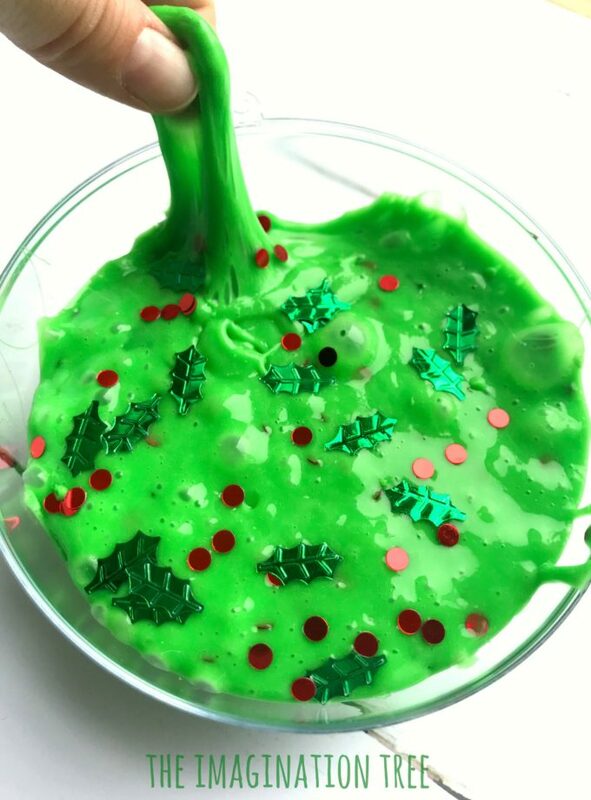 We’ve made three fun Christmas themed slimes over the past couple of weeks and they’d be so great to make with the kids during the school break or even for the kids to make as DIY gifts for their friends too! The basic recipe is so simple, uses easy to find ingredients that are readily accessible here in the UK and rest of Europe, and in my view is safer than some of the other recipes which use neat cleaning detergents as the key ingredient. 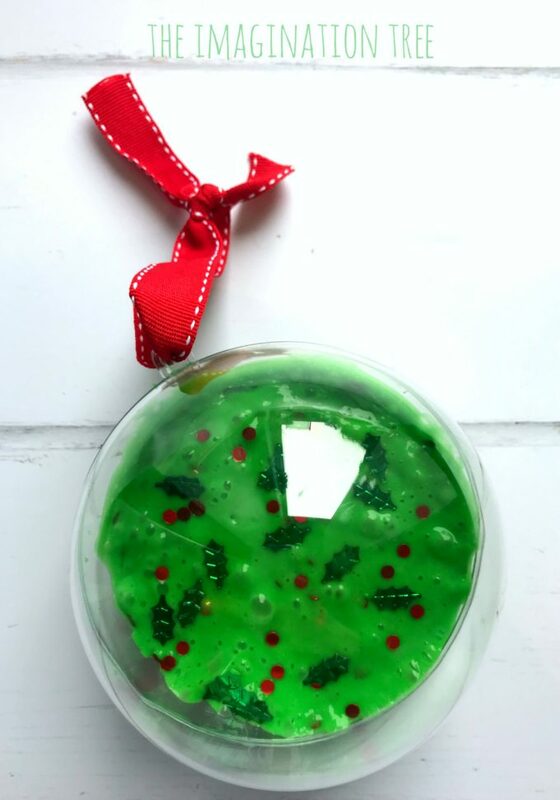 The holly and berry sequins really make this a gorgeous slime to play with, but you can of course substitute for other Christmas themed additions too! Add 1/2 teaspoon of green food colouring and mix until you make a bright green shade. Next add 1-2 tablespoons of contact lens solution. 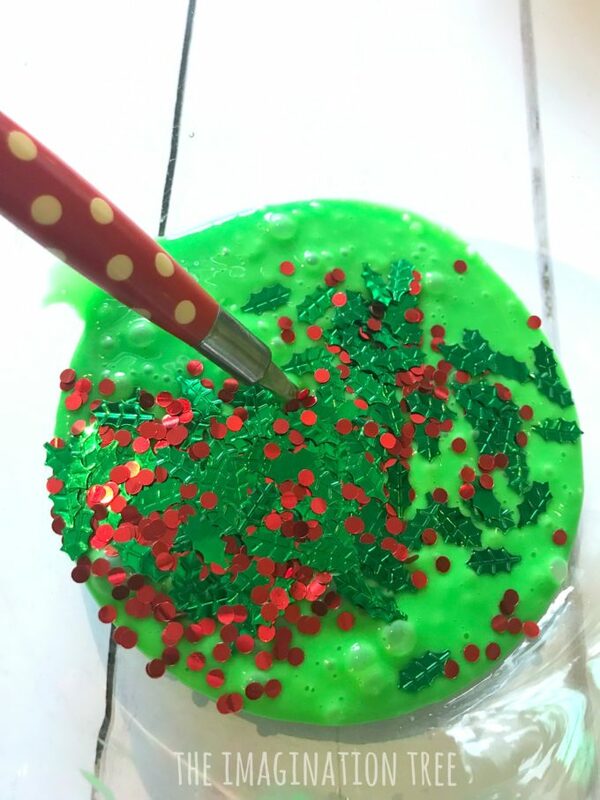 Now liberally sprinkle the sequins over the Christmas Tree Slime and mix them in until it sparkles beautifully! 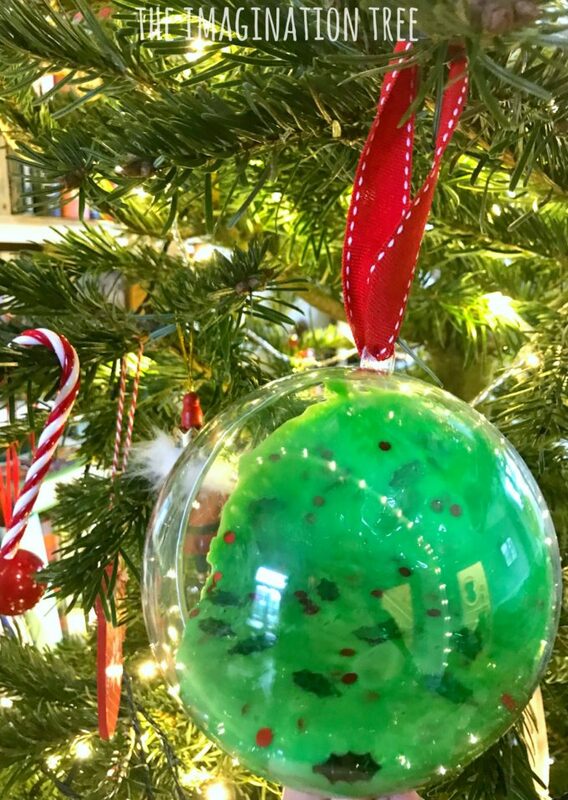 This Christmas Tree Slime looks gorgeous when packaged up in clear baubles and tied with red ribbon and would make a perfect gift for the kids to give to their friends! It even looks fun hanging on the tree too. We used some giant clear baubles but these smaller ones would mean that one batch of slime could be shared out even further. 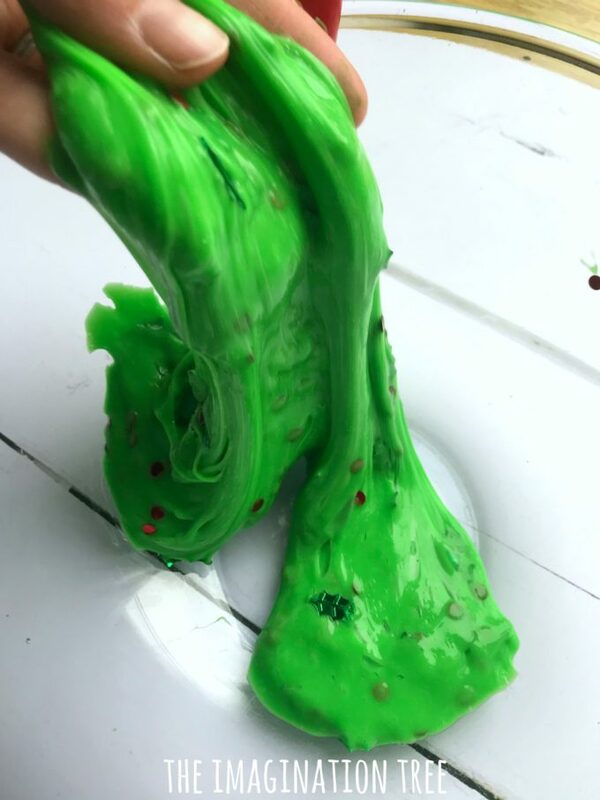 I hope you loved this Christmas Tree Slime! If so, you’ll also like our GALAXY SLIME! If you love SENSORY PLAY check out these archives for plenty of inspiration. 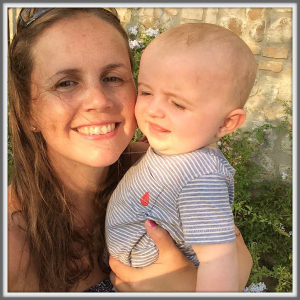 If you have a baby or toddler you may prefer our SENSORY PLAY IDEAS for BABIES here! 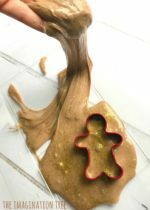 If you’re a huge fan of PLAY DOUGH see our dozens and dozens of scents, flavours and imaginative play ideas! 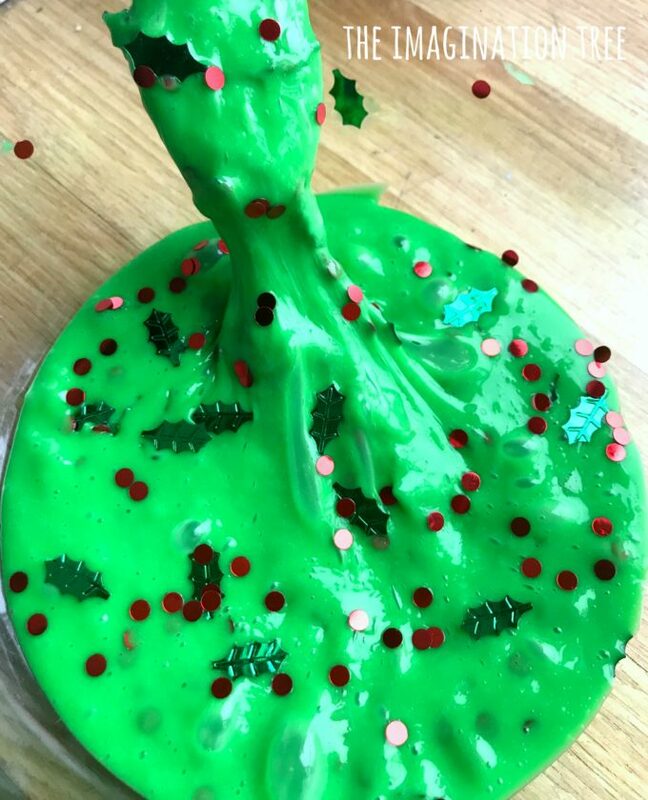 And if you loved this easy peasy Christmas Tree UK slime recipe please consider sharing it with your friends and pinning it to Pinterest. Thanks! 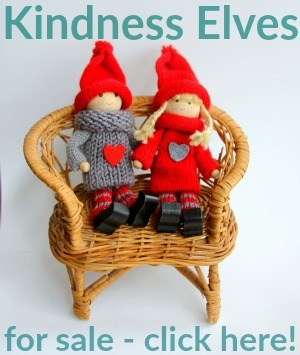 And finally, you can check our entire CHRISTMAS PLAY & CRAFT ACTIVITIES library here. Oh but that slime looks amazing! I’ll be off to get some contact lens solution tomorrow to give it a go. That is gorgeous slime! I will have to try it with the kids at the Garden Art Studio!